Do You Remember... "Adventures of Rin Tin Tin". The original Rin Tin Tin was a male German shepherd rescued from a WWI French battlefield by American Air Corpsman Lee Duncan who trained Rinty and obtained silent film work for the dog. After Rin Tin Tin died in ‘32 the name was passed on to several related German Shepherds including Rin Tin Tin Jr. who appeared in three Mascot serials. However, the original Rin Tin Tin stars in Mascot’s “Lightning Warrior” (‘31). 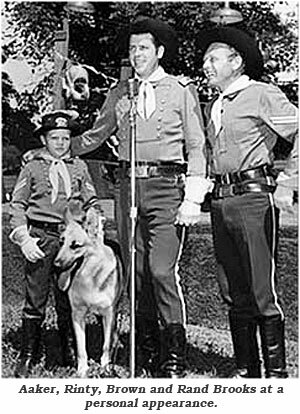 Duncan groomed Rin Tin Tin IV for TV’s “The Adventures of Rin Tin Tin” but when the dog performed poorly he was replaced in the series by trainer Frank Barnes’ dogs, primarily Flame Jr., called JR. Barnes’ dogs Blaze saw screen time and Duncan’s dog Hey You was used as a stunt dog. Beginning on ABC Friday nights from 7:30-8 ET, “The Adventures of Rin Tin Tin” ran for 165 half hour episodes from October 15, 1954, to May 8, 1959. The series went into Saturday afternoon reruns on ABC from September ‘59 to September ‘61. CBS picked it up for another two years in September ‘62 and broadcast it Saturday mornings until September ‘64. 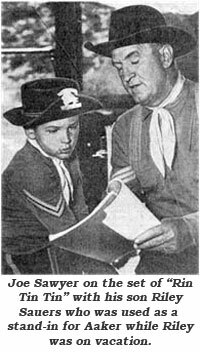 The show starred child actor Lee Aaker as Rusty, a boy orphaned after an Indian raid who was raised by the Cavalry soldiers at Ft. Apache and given an honorary rank as Corporal. Lee was born September 25, 1943, in L.A. and started appearing in films at eight in ‘51. Desdemona, TX, born (3/22/20) James Brown was Lt. Rip Masters; character player Joe Sawyer (1906-1982) was Sgt. Biff O’Hara who was often at (friendly) odds with Corporal Boone, played by Rand Brooks (1918-2003). Major Swanson (William Forrest) was in charge of Ft. Apache. 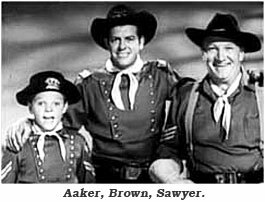 Other recurring characters included Tommy Farrell as Corporal Carson, Hal Hopper as Corporal Clarke, Syd Saylor as storekeeper Pritikin, Harry Strang as the Salt River Sheriff and Andy Clyde as Homer Tubbs. The 165 episodes were populated by a Who’s Who of B-Western talent as well as up and coming names at the time like Lee Van Cleef, Jack Elam, George Hamilton, Jerome Courtland, L. Q. Jones, Robert Fuller and Warren Oates. Herbert B. Leonard produced the majority of the episodes assisted by Douglas Heyes and Jerry Thomas who also scripted 44 and 36 episodes respectively. Other writing credits came from well known scripters such as Tony Barrett, Buckley Angell and Samuel Roeca as well as lesser known names. Directing credits were spread among 10 well respected Western film names such as Robert G. Walker (54 episodes), Earl Bellamy, Lew Landers, William Beaudine, Douglas Heyes and others. “Rin Tin Tin” was primarily filmed at Corriganville using the fort set there. The program took occasional excursions to Big Bear, Vasquez Rocks and Bronson Canyon. James Brown said one of the most popular episodes, “White Buffalo”, was filmed at the Santa Ana, CA, Buffalo Ranch, “The only show we shot in four days, our average was two and a half days for an episode,” Brown stated. According to Brown the crew painted the head buffalo with white paint mixed with milk. Rand Brooks once told WC, “My role of Corporal Boone wasn’t to be a permanent part. It was just an added character. Then they signed me to a regular contract. I got along well with the dog—which they didn’t all know how to handle. (Laughs) Lee Duncan had the original Rin Tin Tin. The first day on the series he couldn’t cut it with the dog he had. The dog just wouldn’t work—he was lazy and had no spirit. But they had Frank Barnes as protection with a double dog…the son of Flame, Golden Boy Junior. Barnes was the most magnificent German Shepard trainer…all the dog trainers acknowledged, nobody could train like Frank. Then Lee Duncan came up with a little smaller dog called Hey You that did the fights, and he was a mean sucker (Laughs). He did some of the running with the horses too. Lee Aaker was a wonderful kid, a good little athlete. He got along with the dogs fine. Jim Brown got along with everybody. He just didn’t know an enemy. The camaraderie between the group was excellent. It was one of the nicest relationships—we all loved the boy, we usually had good directors, like Earl Bellamy. 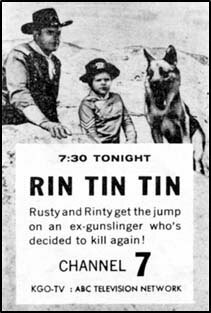 ‘Rin Tin Tin’ was ABC’s #1 show. We made ‘em for $25,000 per segment, which was soon raised up to $30-$35,000. Joe Sawyer (Laughs) and the dog probably made more than anyone, ‘cause Joe had years and years of experience—and he was independently well to-do, which helps when you’re negotiating a contract. He built some 200-300 homes out in Santa Paula—and he carried the paper on ‘em. He was a great raconteur. As to promotional tours, I did the first ones—Madison Square Garden then Boston Gardens. I said the wrong thing about some low per diem pay to producer Bert Leonard, so they fired me and hired Tommy Farrell, who was Bert’s cousin incidentally, as Corp. Carson. Then ABC and the sponsor, Nabisco, said, ‘No, we want Rand Brooks.’ Doug Heyes did a lot of writing on the series. He had me getting married on the show (“Boone’s Wedding Day”)…I even played my own grandfather in a couple of ‘em (“Boone’s Grandpappy”). I think that’s what saved my work on the series. Nabisco loved that show and wanted another one. (Laughs) They said they wanted Rand Brooks back to do another Grandpappy Boone.” (“Grandpappy’s Love Affair”). 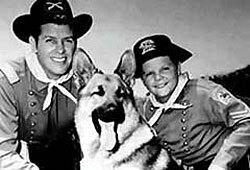 Without a doubt, “The Adventures of Rin Tin Tin” is one of the most fondly remembered shows of the ‘50s.